As a proudly Canadian and family owned company, we know the importance of supporting our local economy. That's why, in addition to our local food program Our Ontario, we offer a unique, convenient way for you to buy Ontario-grown items and incorporate them into your menu. Flanagan Market is our e-commerce website that features niche, local items available for purchase directly from growers and farmers in your area. 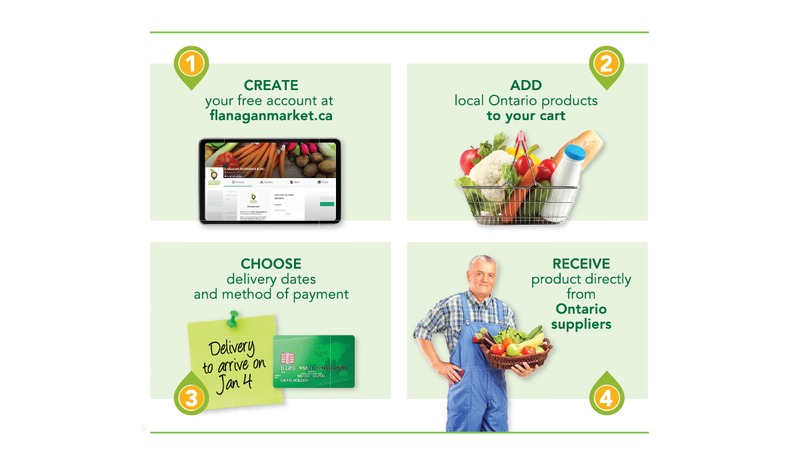 Browse more than 2,000 Ontario grown and produced items and coordinate delivery, payment and pick-up with suppliers themselves. The platform is free to sign up and there are no charges (ever!) for use. From Rootham Gourmet Preserves to Block Three Brewing Company, our Flanagan Market storefront features 35 Ontario suppliers who meet CanadaGAP and provincially-regulated standards. For more information, check out our 2-minute video demo on how to place an order with the Flanagan Market here. If you have questions regarding the Market, please contact your Territory Manager or reach out to Katrina Couto.